Finding Great Fabrics for Drapes or Upholstery - Sew What? Sew Anything! I love great fabrics, any kind of great fabrics! Unfortunately, fabric shopping in the greater Lansing area has been a challenge since some fine fabric stores have closed; Calico Corners in Okemos and Fabric Gallery in Williamston closed up a few years ago. Since good quality fabrics reflecting current styles and trends are hard to find in our area, bringing top fabric lines to our area made good sense and good value for our customers. 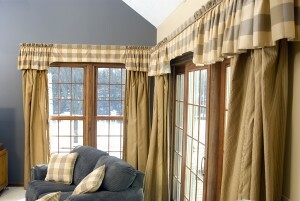 Window treatments will have a great flow if you use good quality fabric. So, why not start with great fabric? If you start with a great fabric and add a great design your project is going to be fabulous. Great fabrics wear well. If you are looking to upholster a big stuffed chair, you want a fabric that will look and feel luxurious. When it comes to upholstery you are investing in your furniture piece and if it is worth investing in make sure that your fabric is good fabric that will look good and wear well. You want your home to look its best, and using good quality fabric will help you get the desired result. At Sew What? Sew Anything! we represent great fabric suppliers like Robert Allen, RM Coco, J. Ennis, Fabrictix, and Luxury Fabrics. In our workroom there are nearly 100 fabric selection books and five bins packed full of fabric samples. You are welcome to select some fabric books and samples to take home and view your fabric choices in your own home before you buy.